I am of the belief that there is simply no such thing as a completely objective review, especially when it comes to board games. No matter how hard a reviewer tries, their prejudices and tastes will influence their opinion of a game. 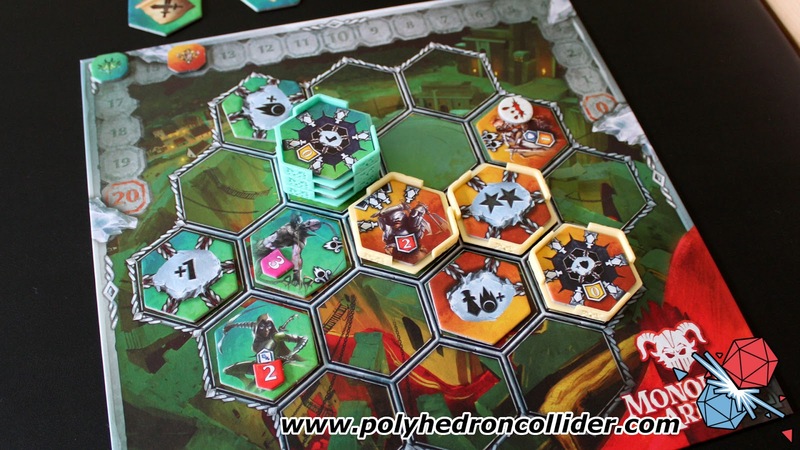 I say this because I absolutely adore Neuroshima Hex, it is easily one of my top ten board games of all time, and I think you should be aware of this before I start talking about Monolith Arena, a sequel/remix of the original hex based tile laying battle game. So if, like me, you are already a fan of Michał Oracz's game, here’s the short review; Monolith Arena is bloody brilliant and you should go buy it. No doubt most of you will be wanting a bit more depth to a review, however, so here goes. 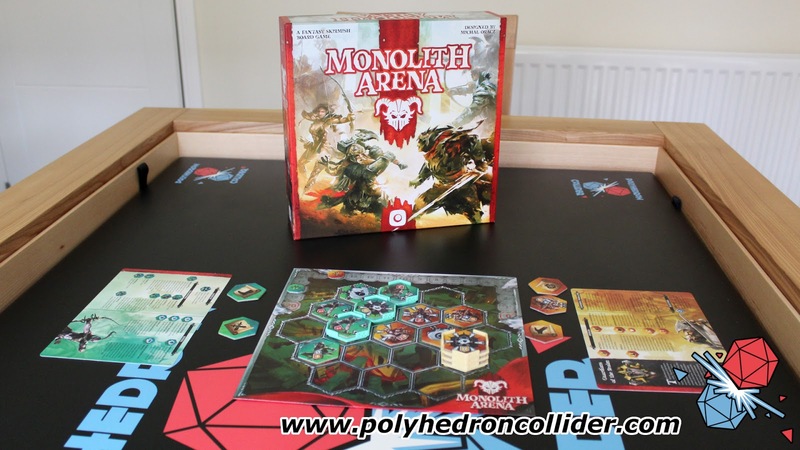 Monolith Arena is a two to four player battle game in which you take on the mantle of one of four fantasy races, with the simple aim of kicking the living snot out of each other. 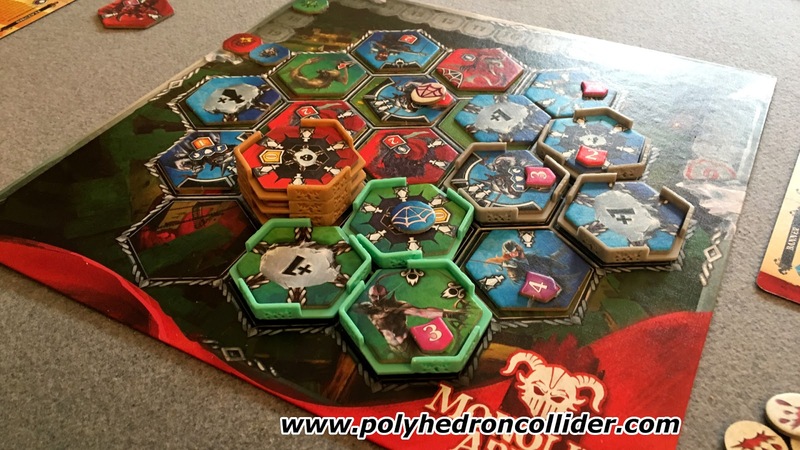 The game is played on a small hex based grid and you will take turns playing your hexagonal tokens—whether they be units, buffs or special effects—onto the board. The aim of the game is to either destroy your opponent’s banner or have the most health when the game ends. If the sign of a good game is the meaningful decisions, then Monolith Arena has them in droves. Each turn you will draw up to three of your tokens and then discard one. It’s the single cleverest aspect of Monolith Arena and also probably the most annoying, and leads to my only criticism of the game. Right from the start you are making an important decision about your strategy, throwing away one third of your forces every turn. It can often be an agonising decision, as you’ll draw three of your favourite units only to have to throw one in the bin like some kind of broken toy. It also highlights the only problem with Monolth Arena; you’re drawing tiles randomly from a deck. and means that there are going to be turns—and sometimes many turns in a row—when you draw absolutely nothing that can help your current situation. This can be incredibly frustrating, and sometimes can even decide the result of the game, as you draw all your units, while your opponent draws nothing but buffs and orders that can’t be used. Although this can feel debilitating, you will typically run through the entire set of tokens so everything should balance out by the end of the game. The meat of this game, however, is how your tokens are placed. You’ll be supplied with a veritable menagerie of units; ranged units, melee units, net units, shield units, even assassins and charging knights. Each of the four factions has access to different units and special abilities which means that each faction plays and feels completely different. Neuroshima Hex players will also be pleased to know that these are not just a rehash of the units in that game, they are completely new and introduce new strategies and nasty tricks. Turn by turn you’ll slowly stitch together this tapestry of death, units will be placed, counter units will be positioned and some units will even move, but not a single shot has yet to be fired. Imagine a game of chess but you can’t take any pieces, only manoeuvre them into position ready for the big onslaught. Whether through a special battle action, or the board filling up, sooner or later things are about to get nasty, and nasty they do get, as the arena is bathed in blood and broken cardboard. Resolving a battle in Monolth Arena can be a complicated affair, but thankfully due to some extra tokens is easier to manage than in its predessor. Units activate in initiative order, with every unit at the same initiative acting at the same time. It can be a little complicated to keep track of but as long as you remain systematic it shouldn’t be an issue. It’s at this time where you see if your carefully laid plans come to fruition, but I can guarantee that there’s always something you’ve forgotten about, or not thought about fully, and a single point of damage by a high initiative unit can throw all your plans to the wind. Resolving a battle is always rather tense. Even though there is no randomness there’s always this feeling of uncertainty, which is always your own faults. After damage has been dealt, the battlefield is usually clear, ready for another round of careful unit placement and there’s something strangely satisfying about seeing the results of such wanton destruction, even if you didn’t come out on top. New to Monolith Arena are the concept of monoliths, stacks of units that add another layer of strategy to the game. You can choose to play without them, but after giving them a whirl, I will be using them every time I can. 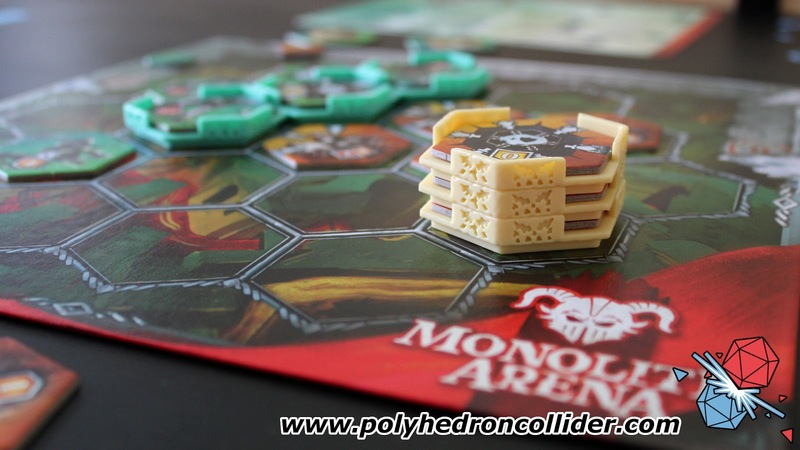 Monoliths contain two extra tokens that you choose, and at any point in the game, you can ‘unfold’ the monolith to bring these units onto the board. I must admit they’re tricky little beasts, and choosing the right units to place into them is paramount but their use adds further interesting decisions to a game that is ripe with them. 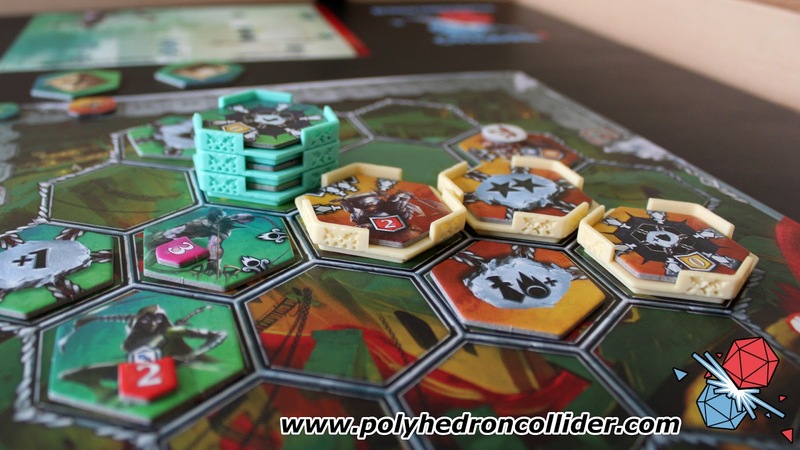 Neuroshima Hex has always been one of my favourite board games, and Monolith Arena changes just enough of the core concept to make the game feel both fresh and add an extra layer of complexity to what is already an astounding and unique game.